Preterm neonates remain at increased risk for adverse bilirubin-related outcomes, including acute bilirubin encephalopathy relative to term infants. Yet, most vulnerable neonates are likely to benefit from the potent anti-oxidant properties of bilirubin. 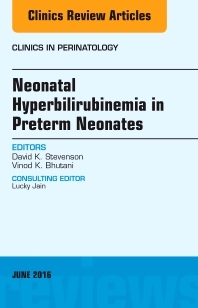 Evidence-based guidelines for the management of hyperbilirubinemia in preterm infants, however, are lacking. High concentrations of unconjugated bilirubin can cause permanent neurologic damage in infants, evident through magnetic resonance imaging of chronic bilirubin encephalopathy or kernicterus. There is a growing concern that exposures to even moderate concentrations of bilirubin may lead to subtle but permanent neurodevelopmental impairment referred to as bilirubin-induced neurologic dysfunction. Our current use of phototherapy to decrease bilirubin loads and its potential photo-oxidant properties is a biological conundrum that has been questioned in the use of phototherapy for very low birth weight neonates. In this issue of Clinics in Perinatology, we provide updates on the current understanding of the biology, mechanisms of increasing bilirubin load due to hemolysis, decreased bilirubin binding capacity and glucose-6-phosphate dehydrogenase deficiency, as well as clinical strategies to operationalize the thresholds for hyperbilirubinemia interventions in preterm infants.